InteraXon’s downtown headquarters on John Street. Photo by D.A. Cooper/Torontoist. Telekinesis—the ability to move matter through thought alone—has long served as fodder for comic books, late-night cable specials, and drug-fuelled fantasies. But aside from the occasional shiftless Star Wars nerd faced with a chicken wing just out of arm’s reach, it’s not something most of us take seriously. Why then did executives from Boeing and Bombardier, attending a demo presented by Toronto-based tech start-up InteraXon, recently test out an in-flight entertainment system for passengers to control with their minds? Believe it or not, brain-computer interfaces (BCIs) that allow minds to link directly to machines have been kicking around university and government laboratories for some time now. In the ’70s researchers from the National Institute of Health in Maryland showed that monkeys could be trained to control small mechanical-feedback devices with their brains. These days scientists have primates feeding themselves through robotic prostheses. Snacking cyborg monkeys like this one may seem like science fiction, but InteraXon CEO and co-founder Ariel Garten feels assured that “thought-controlled computing is the future of human-computer interaction.” Her company is on a mission to prove it’s a viable business concept as well. Every time a neuron fires, it makes a noise. It’s the sound of charged ions being repelled into intercellular space. At any given moment, there are over a billion neurons firing in your brain. Take the cumulative sound of all these neurons firing at once and you’ve got a brain wave—an electromagnetic signal loud enough to register outside your skull. Brain waves can be used to diagnose neurological disorders like epilepsy and dementia. They can also reveal what you’re thinking—kind of. The two most common types of brain waves, alpha and beta, are associated with distinct mental states. Alpha waves signal relaxation and reflection, while beta waves indicate concentration and alertness. Brain wave recording technology has evolved considerably over the past decade. Applications that once required a dense mass of wires and electrodes can easily be accomplished with a simple, inexpensive, consumer-ready wireless headset. By calculating the relative magnitude of an individual’s alpha and beta waves, you get a pretty good indication of how relaxed or focused they are. This variable can then be used to control basically anything that can be hooked up to a computer. Like, for instance, a chair that levitates when you enter a very relaxed state. Or lighting that corresponds to your mood. Garten explains that you can actually train people to control their alpha and beta waves fairly easily. Uncle Milton’s Star Wars Force Trainer, which teaches kids to focus better while indulging their taste for useless/expensive crap, works on the same principle. Concentration causes beta waves to increase, which in turn makes a small ball levitate. With just one variable to control—a linear continuum between relaxation and concentration—you have to get creative. Map this continuum onto a musical scale, Garten suggests, so that musicians can jam just by concentrating or relaxing. Or plug it into something huge, like the lights on the CN Tower. There are more complex brain-wave signals, but, Garten says, “most of the things that are off the shelf [work with] alpha and beta.” Of particular interest to the engineers at InteraXon are so-called p300 brain signals that actually register when you notice something. Pretty soon, Garten explains, we’ll be able to create computer menus that users can navigate just by thinking. 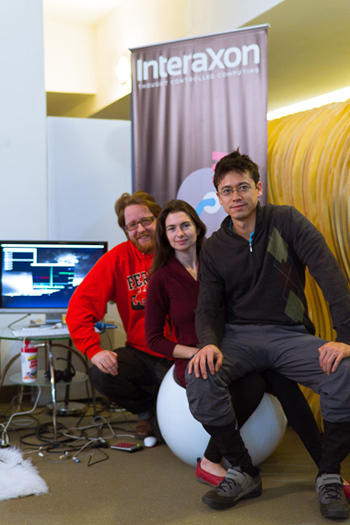 InteraXon’s founding members, left to right: Trevor Coleman, Ariel Garten, and Chris Aimone. Photo by D.A. Cooper/Torontoist. “This technology is really pan-domain,” she says. “In twenty or thirty years this is going to be a ubiquitous way to interact.” In five years, Garten claims, we’ll see a ton of health and brain-fitness applications. In an office dotted with amorphous concept art and eggshell furniture, forecasting twenty years ahead seems as reasonable as predicting tomorrow’s weather. It’s easy to overlook the fact that thought-controlled computing still has a long way to go. We’re not quite at the point where we can play Halo, or even Super Mario, with our minds. No matter how you dress it up, the “mind control” offered by consumer-ready BCIs is still pretty basic: relax, and your alpha/beta ratio goes up, concentrate and it goes back down. Just how many interesting games, or useful business applications, can you design for what is essentially a mental dimmer switch? Gameplay has evolved considerably in the past four decades, yet thought-controlled computing, behind its gloss of futurism, recalls a much simpler era in our gaming past—when minimalist design was beautiful and story arcs non-existent. The Swedish game, Mindball, where players sit across from one another and compete to control the trajectory of ball that’s placed between them, not-so-subtly echoes the mechanics of Pong. It’s unclear if consumers will be willing to shell out big bucks for BCI systems that can barely replicate Space Invaders. A number of tech reviewers have questioned whether this technology is really ready for the mass market. 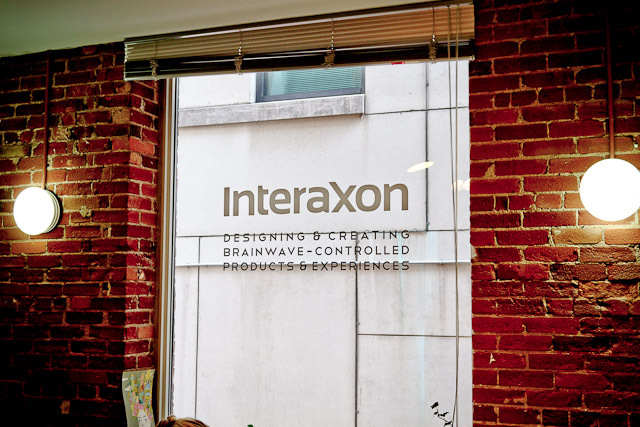 But if controlling a ball or a set of lights with your brain waves doesn’t sound like typical Saturday afternoon beer-and-bong fare, the folks at InteraXon would argue that it at least got you thinking. Garten, who streamed her own brain waves last week during a lecture at Le Web in Paris, sees brain-computer interfacing as a transformative act. She likens brain waves to a muscle we never even knew we had. Not only will BCIs increasingly blur the line between man and machine, Garten suggests they will also fundamentally change how we view our own bodies. The dark side of this exchange isn’t hard to imagine: it’s played out in thousands of dime-store comics. How might a fragile psyche react to such a drastically altered sense of self? What about the physical dangers posed by placing large industrial or even military machinery at the whim of someone’s imagination? What about people stealing our thoughts?! Garten believes that it’s InteraXon’s job to guide us through the challenges we’ll face as we increasingly plug our minds into our MacBooks. It might sound like a high-minded goal for a tech start-up, but thought-controlled computing is still in its formative stage. Companies like InteraXon have the power to shape the way we perceive and interact with this new technology. Might as well flex your alphas while you have the chance. CORRECTION: January 6, 2011, 9:10 AM In this article we originally stated that Boeing was under contract with Interaxon, which is incorrect. Boeing attended a demonstration by the company, but has no signed agreements with them.